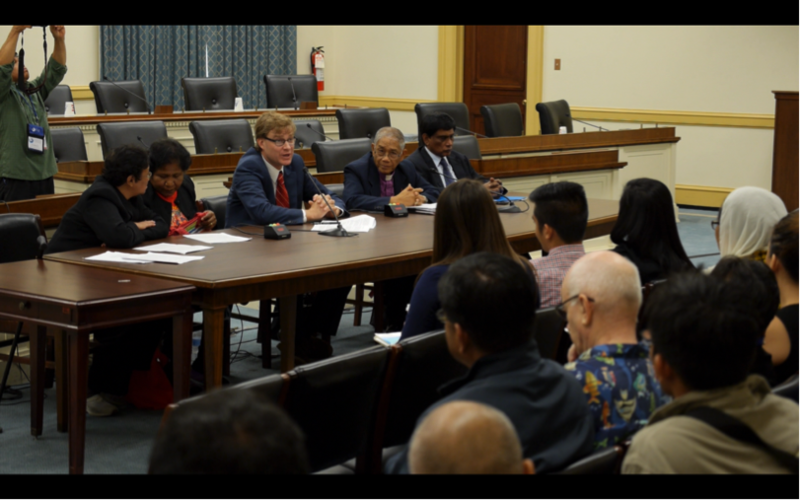 WASHINGTON DC– On the eve of this week’s International Peoples’ Tribunal (IPT) on the Philippines, tribunal witnesses testified at a briefing of the Tom Lantos Human Rights Commission at Capitol Hill. Formerly known as the Congressional Human Rights Caucus, the Lantos Commission is a bipartisan caucus of the US House of Representatives. 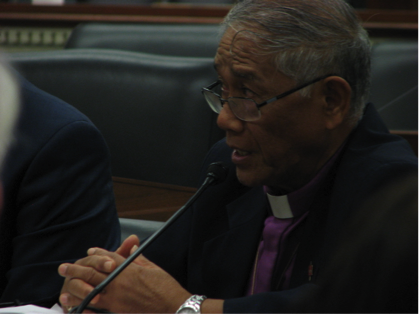 Convened by the Ecumenical Advocacy Network of the Philippines (EANP), the briefing comes eight years after the 2007 US Senate hearing on the Philippines that led to a historic Senate decision to cut the US military aid package to the Philippine government, based on the Philippine military’s culpability in committing gross human rights abuses. As a result, restrictions were placed in the annual foreign military financing package until such time the Philippine government could prove compliance with human rights conditions, including holding the Philippine military accountable for human rights abuses. The Aquino and Obama governments are pushing to have the restrictions to aid lifted, despite the former not having met the requirements set in 2007. After a meeting in the Philippines in 2014, Presidents Obama and Aquino signed off on a new military pact– the Enhanced Defense Cooperation Agreement (EDCA) that will increase the number of US military troops and facilities in the country. “The US government must address the human rights situation in the Philippines. It cannot use the Asia Pivot or its tensions with China as an excuse to lift the sanctions on military aid to the Philippines. Based on what we heard today from this hearing, those sanctions must remain in place,” stated T. Kumar of Amnesty International, who also testified on the Philippine government’s use of torture and the policy of impunity for the Philippine military. “When you don’t punish the military, don’t hold them accountable, you essentially give the green light to all officers—from the general to the foot soldier—you send the message they can do whatever they want and not have to pay the price,” Kumar continued. Both Kumar and Hilao-Enriquez testified back in 2007. 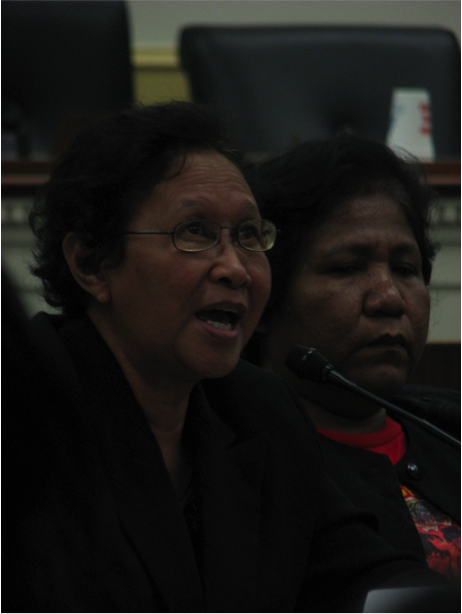 Other witnesses who testified before the Lantos Commission were Marietta Corpuz, an indigenous leader, on the impact of foreign mining and other extractive operations in the country on rural communities, and US labor attorney Brian Campbell with the Ecumenical Advocacy Network of the Philippines. At least one expert witness on the impact of US military intervention on the Philippines, former Philippine Congresswoman Liza Maza of Gabriela Women’s Party, was prevented from traveling to the US upon orders of the US Department of Homeland Security last week. In 2001, the Bush administration declared the Philippines the “Second Front” to the War on Terror. Toquero, Hilao-Enriquez, and Corpuz are set to testify at the IPT this July 16-18 at Catholic University of America, while Campbell will serve on the prosecution team. The public opinion tribunal charges both the Aquino and Obama governments with gross human rights violations against the Filipino people. “It is precisely the culture of impunity, the fact that it is Philippine state authorities themselves committing human rights violations with support from the US government, with no viable recourse for those seeking justice under the Philippine court system, that the victims, the Filipino people, and the international community are compelled to conduct this tribunal,” states Paul Quintos of Ibon International, one of the conveners of the IPT. 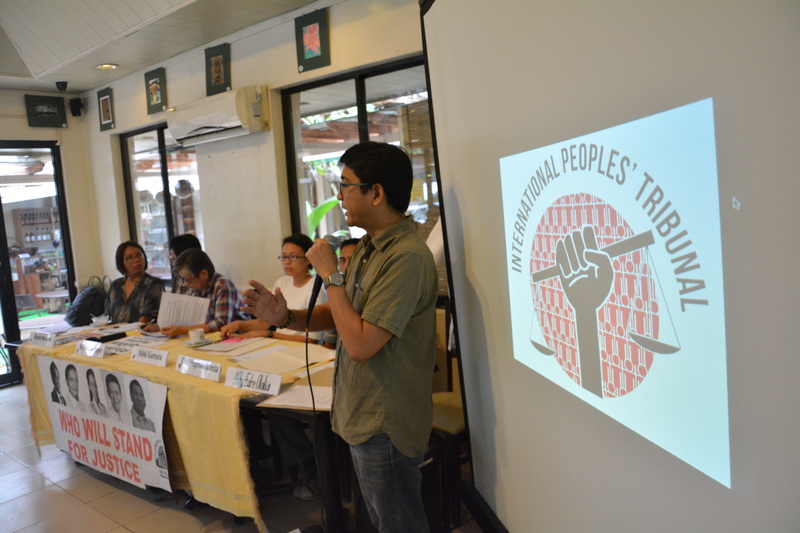 Other conveners of the IPT include the International Coalition for Human Rights in the Philippines, the National Lawyers Guild, and the International Association of Democratic Lawyers. For more information, visit internationalpeoplestribunal.org. WASHINGTON DC– On the eve of an International Tribunal on the Philippines, the Tom Lantos Human Rights Commission will hold a briefing on the Philippines. Testimonies will be delivered from victims of human rights abuses in the country, as well as top human rights watchdog Amnesty International. PRESS ARE INVITED TO COVER THIS EVENT. A 2007 Senate hearing on the Philippines led to cuts in the annual Foreign Military Financing package to the Philippines after evidence pointed to the culpability of the Armed Forces of the Philippines (AFP) in gross human right abuses. Restrictions were placed on the military aid package to the Philippine government contingent on the latter’s ability to prove accountability of AFP and steps taken to stop the abuses. Despite failing to meet the requirements, the Aquino government is strongly lobbying to have the restrictions to the aid package lifted. Along with the victims, human rights advocates in the US and the Philippines are working together and exhausting all channels to keep the restrictions and hold the Aquino government accountable for continuing and aggravating the human rights crisis in the country. For more information, contact Berna Ellorin at 347.244.8953. WASHINGTON DC– As ongoing US-China military tensions over the South China Sea escalate, international human rights advocates are gathering in Washington DC to examine violations to Philippine sovereignty and territorial integrity as a result of escalating US military presence. 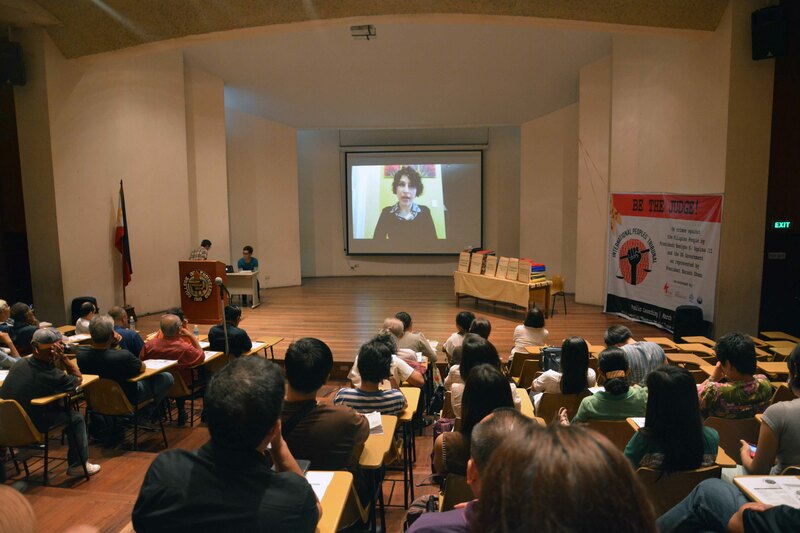 An International Peoples’ Tribunal (IPT) on the Philippines, scheduled for July 16-18 at the Catholic University of America, will tackle the human rights situation in the Philippines as well as the impact of US military presence which is increasing by way of the newly-signed Enhanced Defense Cooperation Agreement (EDCA). Amongst the witnesses traveling from the Philippines to testify in the public opinion court are Philippine Congress Representative Neri Colmenares of Bayan Muna Party List and Suara Bangsamoro spokesperson Amirah Lidasan. “China’s moves in the South China Sea is being condemned around the world, that’s why it’s correct we Filipinos go to the international community and ask for support rather than play into the trap of the US. The US has no concern for the Filipino people. It will not wage war with China to defend the Philippines. It only wants to freely navigate the seas for its own economic and military interests,” stated Colmenares last June 12 at a rally in front of the Chinese Embassy in Manila. Colmenares will serve as an expert witness on the impact of the US-RP Visiting Forces Agreement and the EDCA, both of which have ensured a permanent rotational presence of US military in the country. “Since 2002, we have been reporting on the US-directed anti-terrorism operations in Mindanao, and the secret participation of US troops, but no one believed us. The legislators refused to listen to us. The President refused to listen to us. But now, with the bloodbath at Mamasapano, US-trained Special Action Forces of the Philippine National Police themselves are speaking out about how the whole operation was under the command of the US military with US military troops on the ground,” stated Lidasan at a rally in front of the US Embassy last February in Manila. Lidasan, a native Moro, will testify on secret US drone operations and military presence in Muslim Mindanao, most recently seen in the US-directed anti-terrorist operation in Mamasapano, Maguindanao last January that not only broke rank inside Philippine state forces, but resulted in the death of over 70, including 44 Special Action Forces of the Philippine National Police. Cases filed in the IPT include the murder of Filipina transwoman Jennifer Laude allegedly by a US Marine last October and the destruction of the Tubbataha Reef, one of the most biodiverse marine life sanctuaries and a UNESCO world heritage site, by a US naval minesweeper in the Sulu Sea. “It’s time for US taxpayers to understand the role of their government in the human rights crisis in the Philippines, including the impact of US militarism on the Filipino people and their environment,” states Katrina Abarcar of the International Coalition for Human Rights in the Philippines (ICHRP), one of the conveners of the IPT. Other conveners include the National Lawyers Guild, the International Association of Democratic Lawyers, and Ibon International. A 2007 US Senate hearing on killings in the Philippines led to restrictions placed on a portion of the annual US military aid package to the Philippine government, based on the Philippine military’s culpability in gross human rights abuses. Neri Colmenares and Amirah Lidasan are available for media interviews. 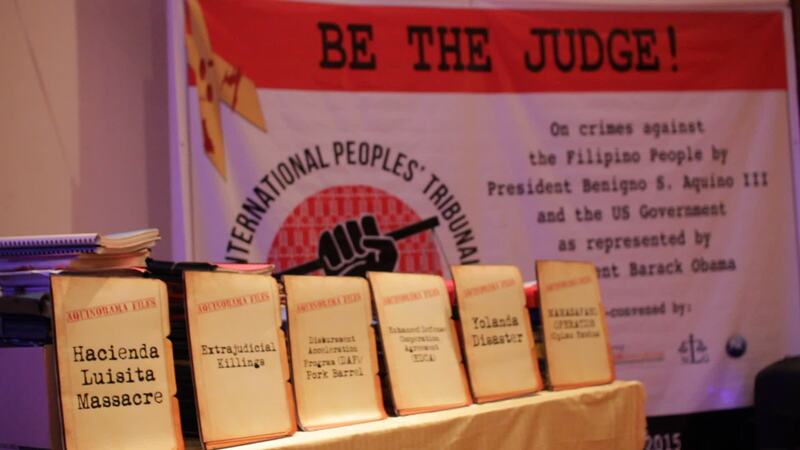 International Peoples’ Tribunal complainants challenge PH presidential bets: will you stand for justice? 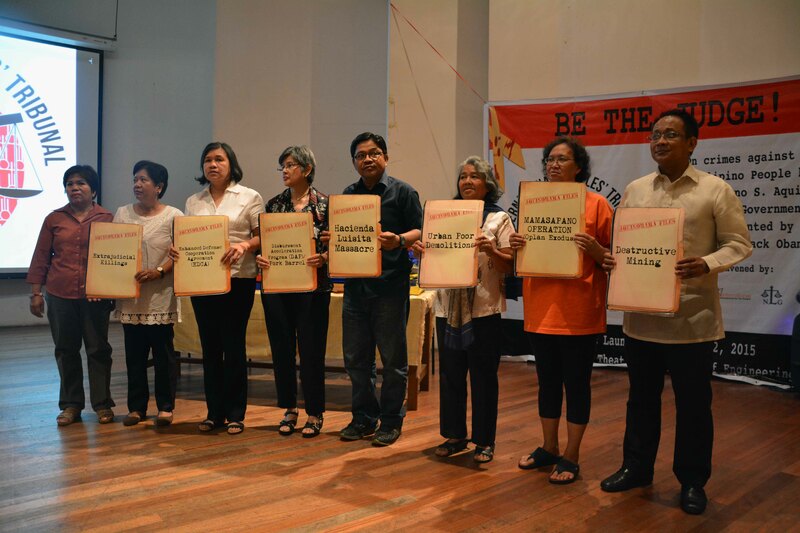 MANILA, Philippines, 16 Jul 2015 – “Will the prospective candidates for the 2016 national and local elections stand for human rights and justice?,” asked human rights victims and kin in a media forum for the International Peoples’ Tribunal (IPT) set to happen next month in Washington, DC. “We don’t need promises. Will the candidates respect, support and uphold the IPT set to try multiple criminal charges against the Aquino government? If the verdict comes out, will they deliver on its resolution once they assume office?” Karapatan Secretary-General Cristina Palabay retorted. Particularly, the challenge was posed before Liberal Party (LP) bet Sec. Mar Roxas, United Nationalist Alliance (UNA) candidate Jojo Binay, National Peoples Coalition (NPC) bets Sen. Grace Poe and Sen. Chiz Escudero, and Davao City Mayor Rodrigo Duterte. “There are several levels by which they can stand for rights victims. One is to respect the tribunal, more substantial than formal recognition is to support or even endorse the tribunal. And, more lasting and relevant for victims, is to uphold the findings of the tribunal and commit to ending impunity,” explained Atty. Edre Olalia of the National Union of Peoples’ Lawyers (NUPL). The IPT is set to hear complaints form plaintiffs Karapatan, Hustisya, Desaparacidos, Selda, Ecumenical Voice for Human Rights and Peace in the Philippines, Bagong Alyansang Makabayan (Bayan) and its affiliated mass organisations. Complaints consist mainly of violations of civil and political rights including killings, abductions, illegal detention and torture; economic, social and cultural rights; and the rights of the people to national self-determination and the right to resist. The IPT convenors include the International Association of Democratic Lawyers (IADL), the US-based National Lawyers Guild (NLG), the International Coalition for Human Rights in the Philippines (ICHRP), and IBON International. Among its endorsers is US-based ANSWER (Act Now to Stop War and Racism) Coalition, a movement that ignited the largest coordinated antiwar actions in history. Prosecution would be led by former US Attorney-General Ramsey Clark with an eminent international jury that includes former President of the National Lawyers Guild (NLG) Azadeh Shahshahani, UN Human Rights Council advisor Camilo Pérez-Bustillo, International Affairs Advisory Committee to the UN representative of the World Council of Churches Rev. Dr. Molefe Tsele, Economic Jutice Network Executive Director Rev. Malcolm Damon, among others. Issues and cases that will be brought before the International People’s Tribunal on the Crimes of the US-Aquino Governments Against the Filipino People. A presentation by Tinay Palabay on behalf of plaintiffs/complainants Ecumenical Voice for Human Rights and Peace in the Philippines, Karapatan, Hustisya, Bagong Alyansang Makabayan, Selda, Desaparecidos, Kilusang Mayo Uno, Kilusang Magbubukid ng Pilipinas, Migrante, Kadamay, Gabriela, Kalikasan, Bayan Muna, et al. WASHINGTON, DC—An International Peoples Tribunal (IPT) looking into the human rights abuses in the Philippines under the administration of Benigno Simeon Aquino III is set to take place in Washington, DC on July 16-18. Former US Congresswoman Cynthia McKinney and prominent human rights attorney Azadeh Shahshahani will be amongst the distinguished panel of jurors who will hear live testimonies of witnesses from the Philippines. Conveners of the tribunal include the International Coalition for Human Rights in the Philippines, the National Lawyers Guild, the International Association of Democratic Lawyers, and Ibon International. “This tribunal is being held at the behest of victims of human rights abuses and other crimes committed under the Aquino government. They are convinced these crimes are committed with impunity under Aquino with the support of the US government,” states Jeanne Mirer, President of the International Association of Democratic Lawyers (IADL), a convening organization of the IPT. “As the call for truth and accountability builds, there is also a growing clamor for President Aquino to step down because of weak leadership, most recently galvanized by his handling of the Philippine National Police operation at Mamasapano, Maguindanao last January that resulted in a death-toll of over 60, including civilians” states Katrina Abarcar of the International Coalition for Human Rights in the Philippines (ICHRP). “The Mamasapano operation raises important questions for us here in the US not only over Aquino’s ability to lead, but over the extent of the US military’s direct involvement in Philippine domestic security operations, especially since we as peace advocates in the US have long lobbied to cut US support to the Philippine military for the latter’s culpability in gross human rights violations, “ Abarcar continued. The IPT will also look into the role of the US government as represented by the Obama administration. Amongst the cases to be heard in the IPT is that of the murder of Jennifer Laude, a Filipina transwoman found strangled to death in a hotel room in Olongapo City after being last seen with US Marine Joseph Scott Pemberton last October. The murder of Laude and retention of US custody over Pemberton despite a Philippine arrest warrant continues to raise public scrutiny over the impact of US military presence in the Philippines by way of the Visiting Forces Agreement (VFA) and the newly-signed Enhanced Defense Cooperation Agreement (EDCA), and the immunity from the Philippine court system US military personnel are granted under these agreements between the US and Philippine governments. International outrage over extrajudicial killings in the Philippines led to a 2007 US Senate hearing that resulted in cuts to the US military aid package to the Philippine government. An official gathering to publicly and formally announce the IPT was held this week in Manila, along with witnesses, victims, and families of victims of human rights abuses.